Recognize it? Its the sample dungeon map in the 1st edition Dungeon Master's Guide, of course, and while the map itself isn't anything particularly special, I have fond memories of reading through this section over and over again as a kid between the time of my first D&D experience (when I was about 6, with my dad), and the next time I got to play (in middle school). For me, using this map has quite a few advantages. Because this bad boy is so old, none of my players will recognize it. The whole dungeon wasn't detailed, so I can keep everything exactly the same and still get creative with the rest. Side Note: As I write this, I keep thinking I've seen this done before either on a website or in Dungeon Magazine, but I'm going to pretend that never happened and continue anyway. 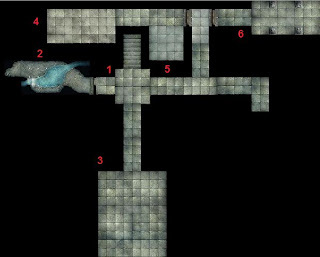 First, I'll need to convert the map into Dungeon Tiles and the best program that I've found to do it is Dungeon Tiles Mapper. As is usual for WotC and their software endeavors, on the official website the program hasn't been updated in FOREVER, so I didn't even have access to cave tiles. Fortunately, it looks like someone else took over and an updated version of the program is available at Jai's Secret Stash. These are only the first 6 map areas, and my final version will not match the original map exactly anyway. More of the map and room details will come in the next installment. I Get to Play? Sweet!